Locate Hwy. E-39 going north from Grodås at the east end of lake Hornindalsvatnet towards Volda. Immediately, at the north end of the long Kvivstunnellen, near lake Kalvassvatnet, exit north and follow the signed road to Bjørke, a small community at the very south end of Hjørundfjorden. Follow the small road that runs along the west side of the fjord, to the farm Finnes, where a forest road (sign for Bakkedalen), heads uphill. This farm is a self serve toll road, pay (NOK 30 in 2015), and drive Bakkedalssætra north of lake Bakkedalsvatnet (364 m). 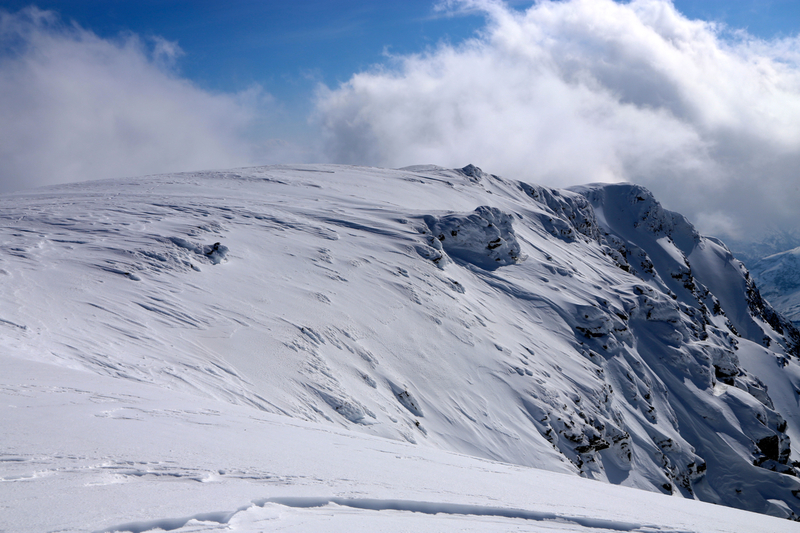 In spring, the road may be blocked by snow before you get this far. 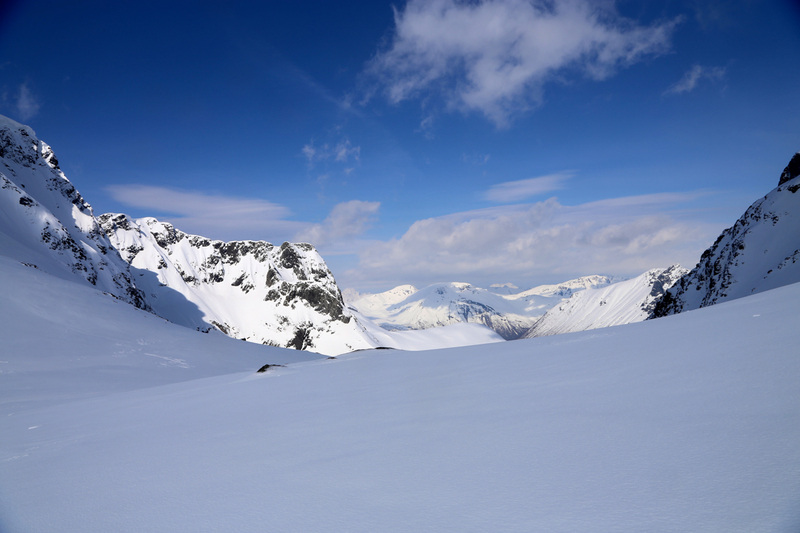 From Bakkedalssætra, follow the road north to about 400 meter of elevation, then climb gently west in order to enter the steep valley that leads up to the (1080m-1100m) col separating Storetinden (west) from Jolhornet/Kvasstinden (east). 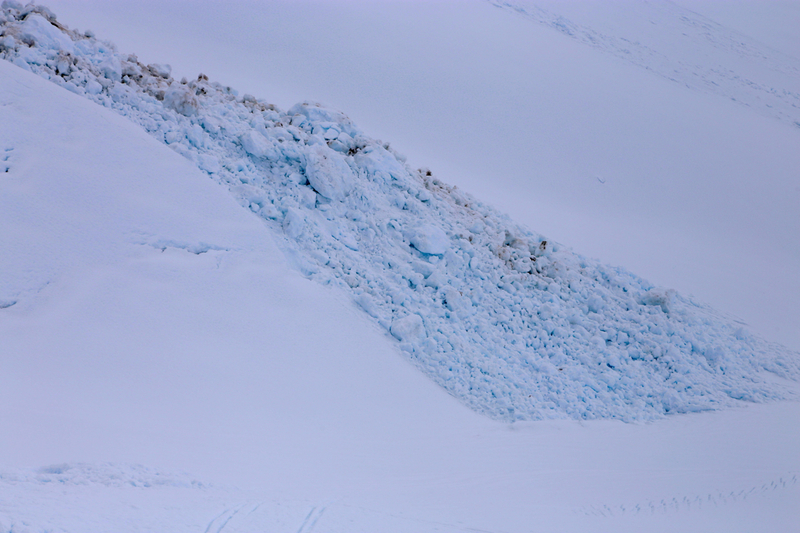 Be aware that this route is subject to frequent avalanches in winter/spring. 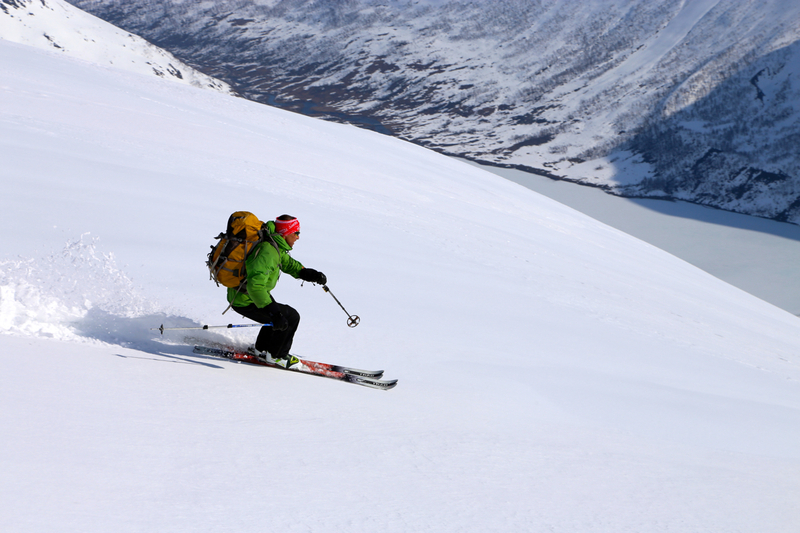 The trip should only be attempted when the snow conditions are considered safe. Cross the creek around elevation 540m, ascend steeply on the left (west) side, as this is (normally) a safer line of ascent. Continue uphill to the col, while staying left of the creek. 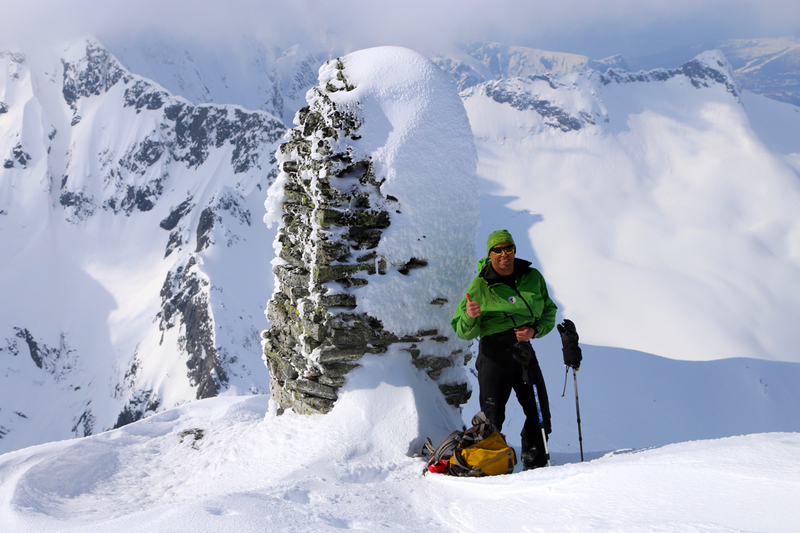 From the col, ascend the distinct ridge (south-west ridge) to gain the first summit (often called Jolhornet). 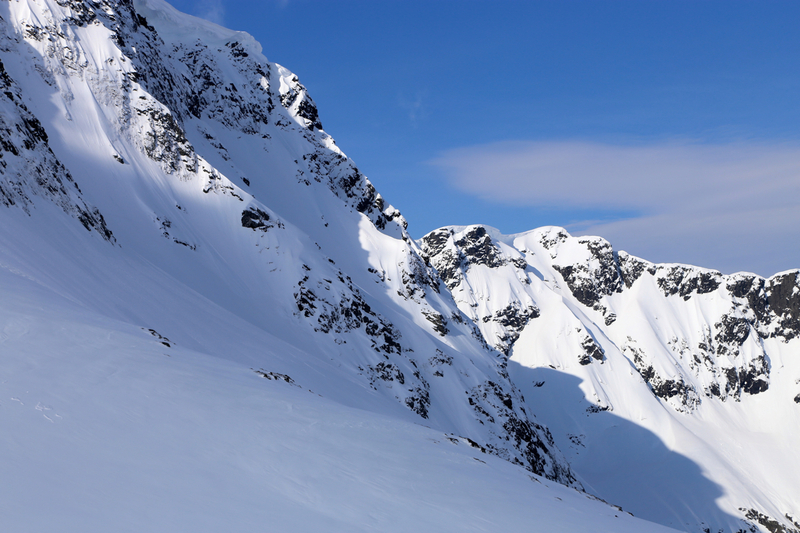 This section may often be better to do on foot (crampons and iceaxe), rather than on skis. 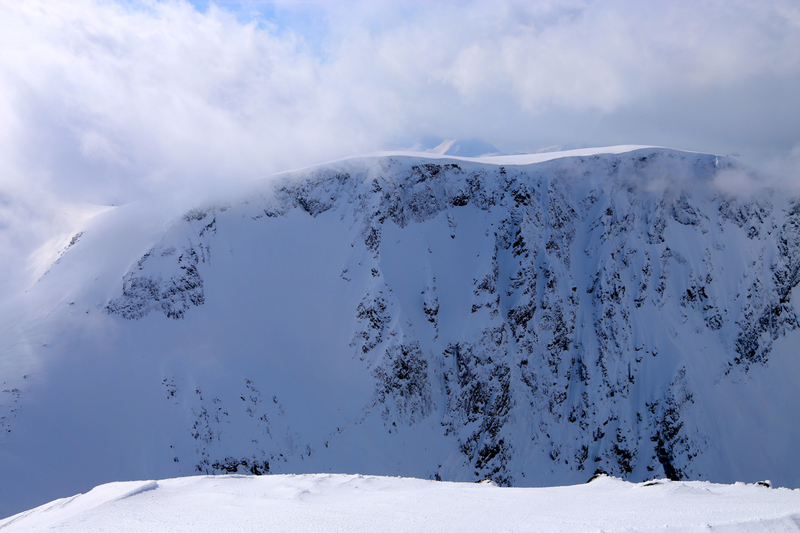 From the first summit, walk north along the ridge. 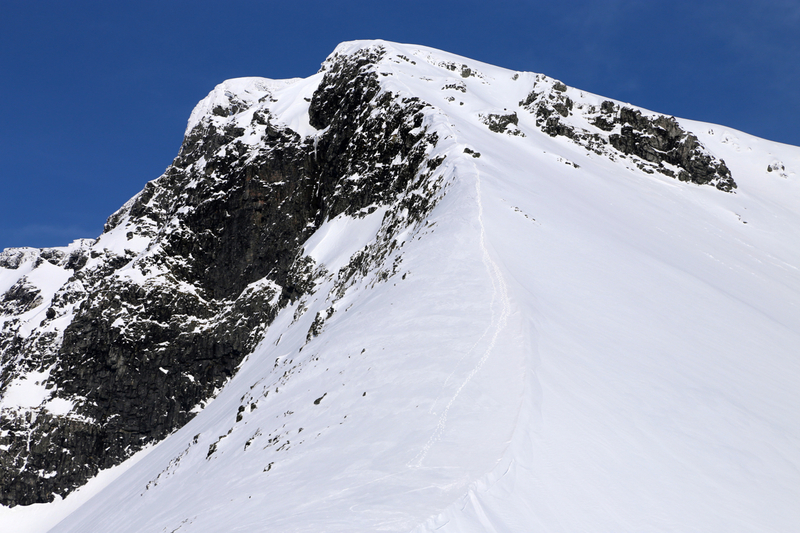 You will now see the route ahead to the main summit, Kvasshornet. 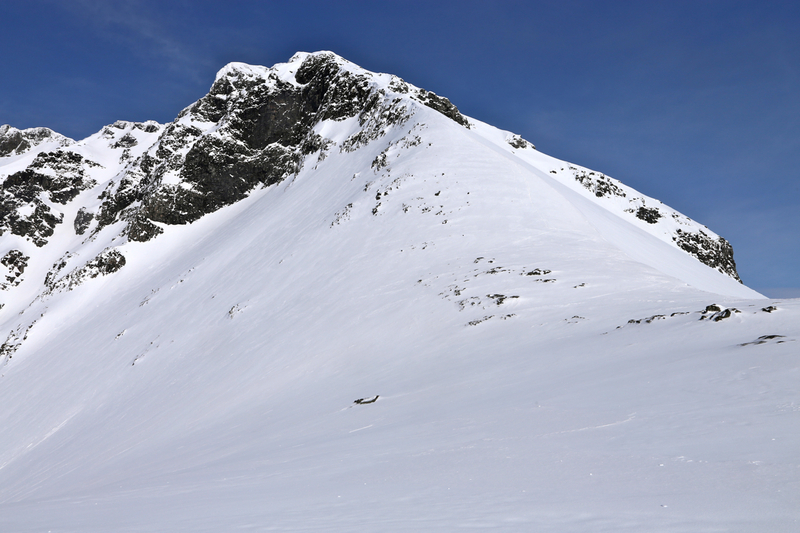 This ridge descends a bit into a small local col where the ridge is blocked by a vertical piece of rock. In winter, proceed to bypass this obstacle on its right hand side. 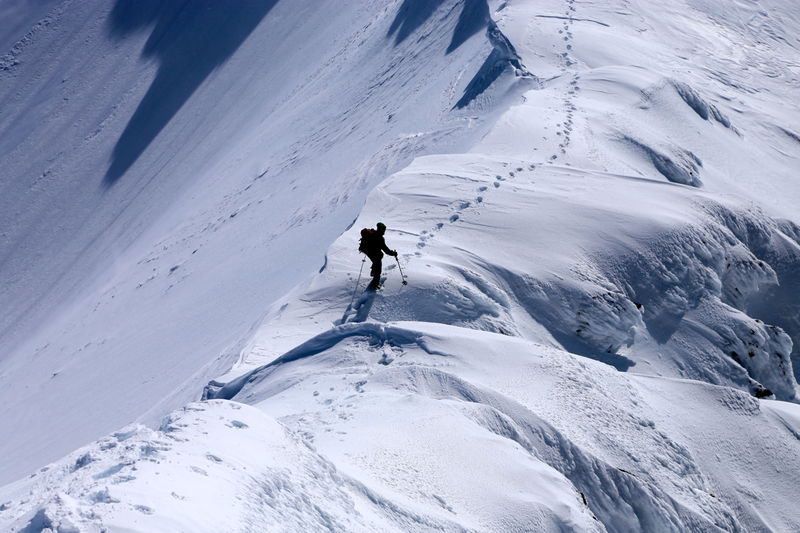 Subsequently, climb left to regain the top of the ridge. 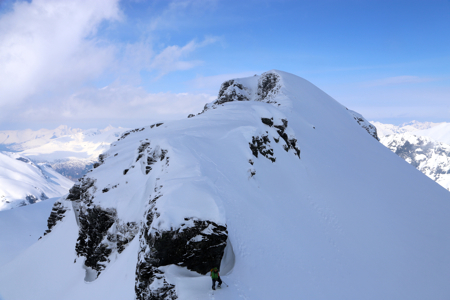 Continue along the ridge (now easy) until you top out at the summit of Kvasshornet. 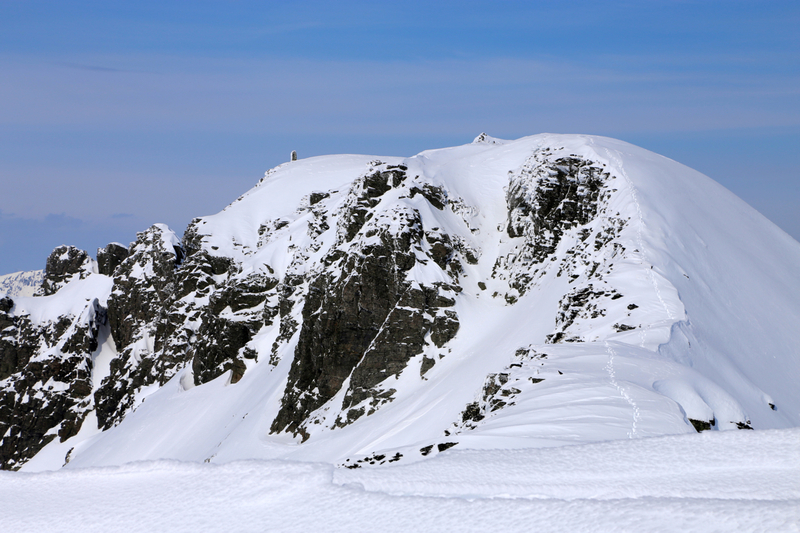 The big cairn is located nearby, possibly a bit lower than the first summit. 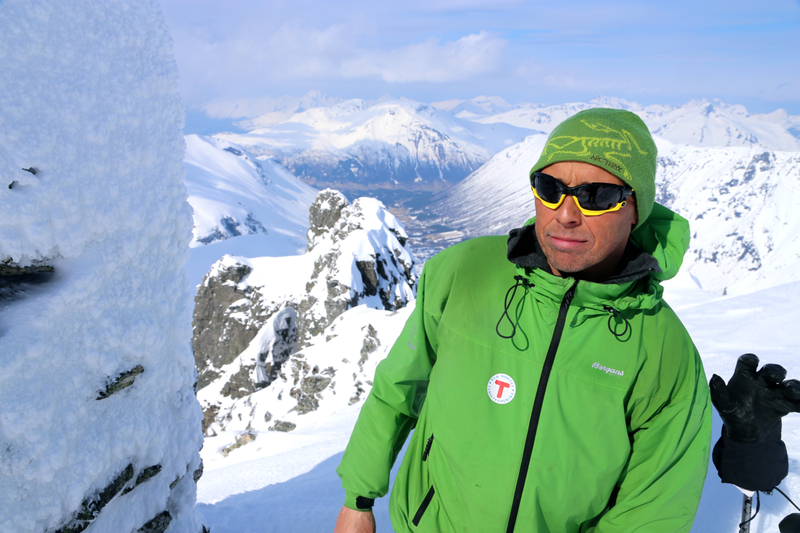 I was attending the national meeting of DNT mountaineering groups this weekend. 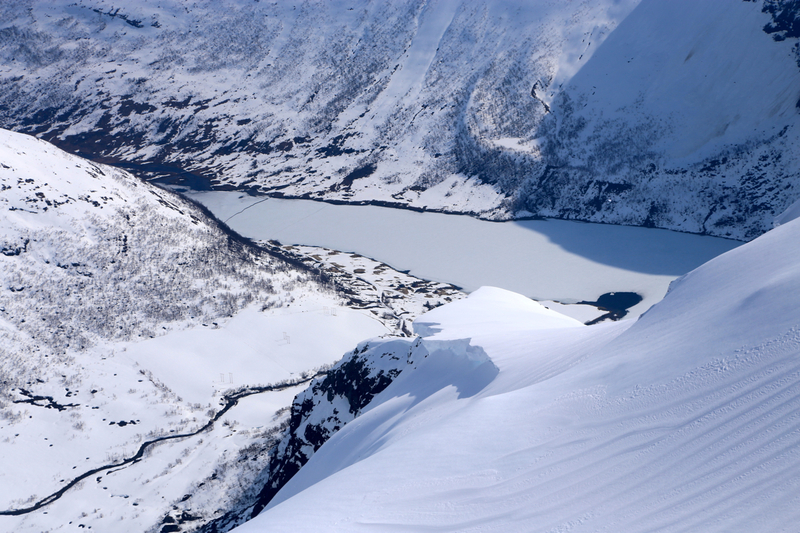 The meeting was at Sæbø on Sunnmøre, a near perfect location for spring (ski) mountaineering. Stig Anton and I set our after breakfast, then drove to Bjørke. We hit snow blocking the road a bit before the top of the initial hill, at location N62.11295, E006.53025, elevation about 280 meter. Parking, we started walking up the road around 0935. The day looked good with scattered clouds and a forecast that promised more sun as the day progressed. 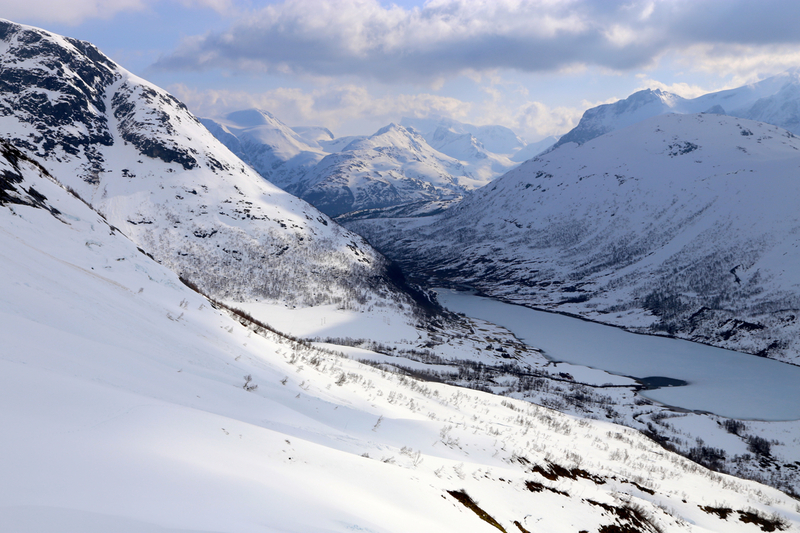 We could put on skis near the east end of lake Bakkedalsvatnet. 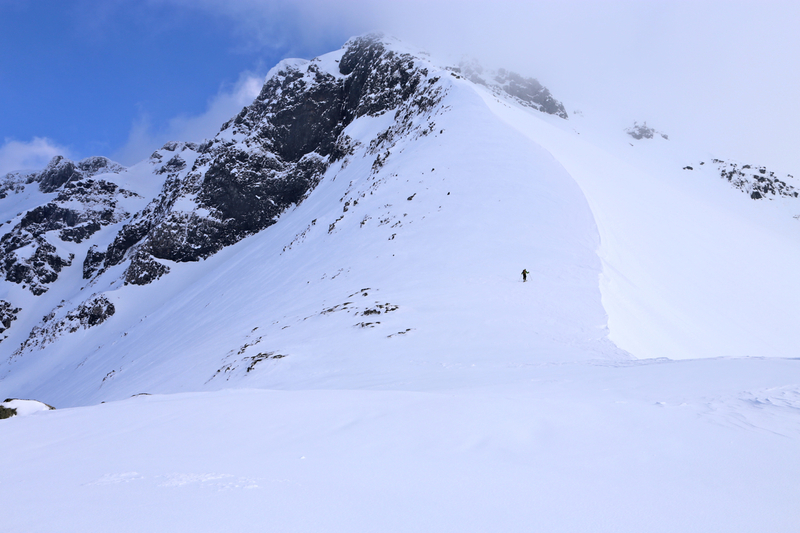 We then easily moved along as we started ascending beyond Bakkedalssætra. 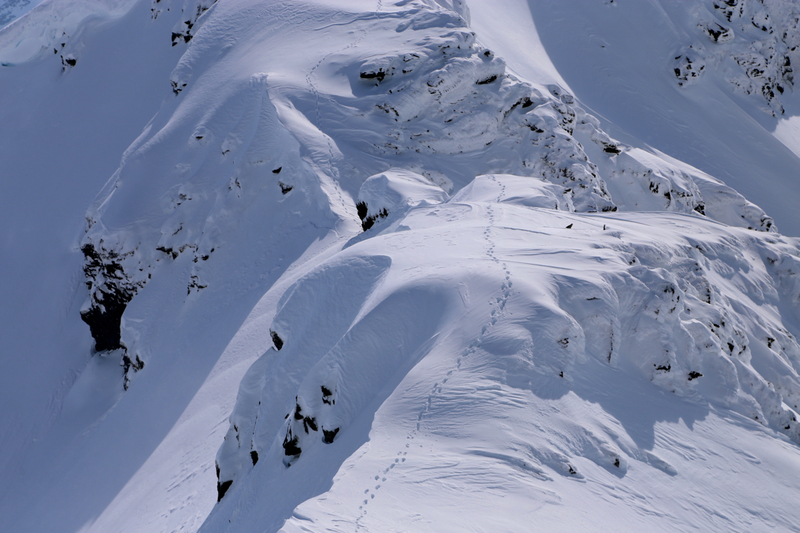 We quickly located several recent avalanches and carefully picked a good line for the ascent. 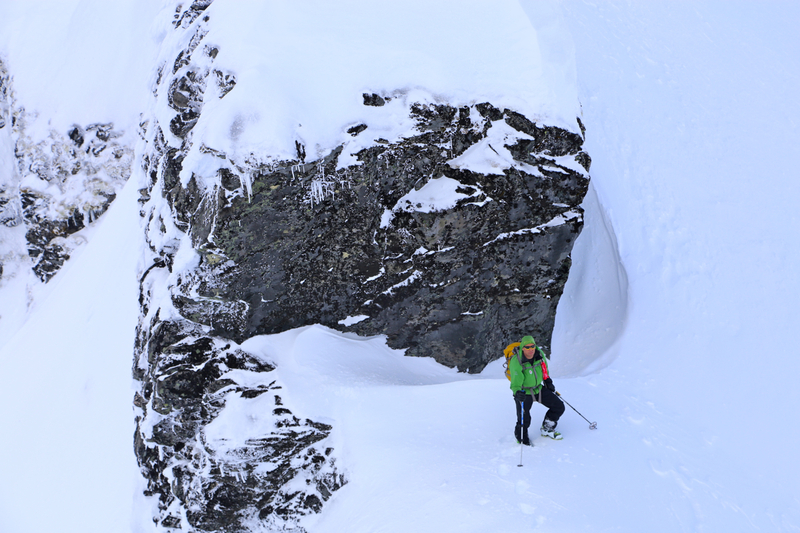 After reaching the col near 1100 meter, we continued skiing up the lower part of the ridge, then decided to leave the skis behind and continue the climb on foot. 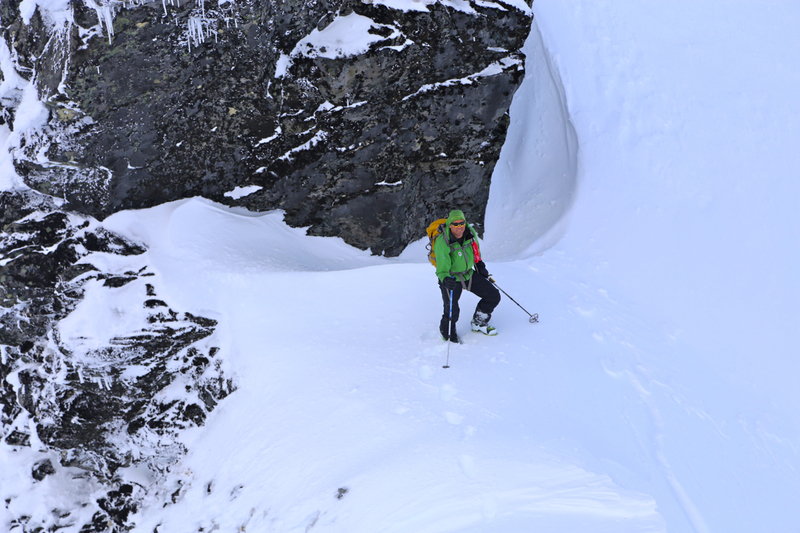 Subsequently, we moved up the ridge using crampons and ice axe. 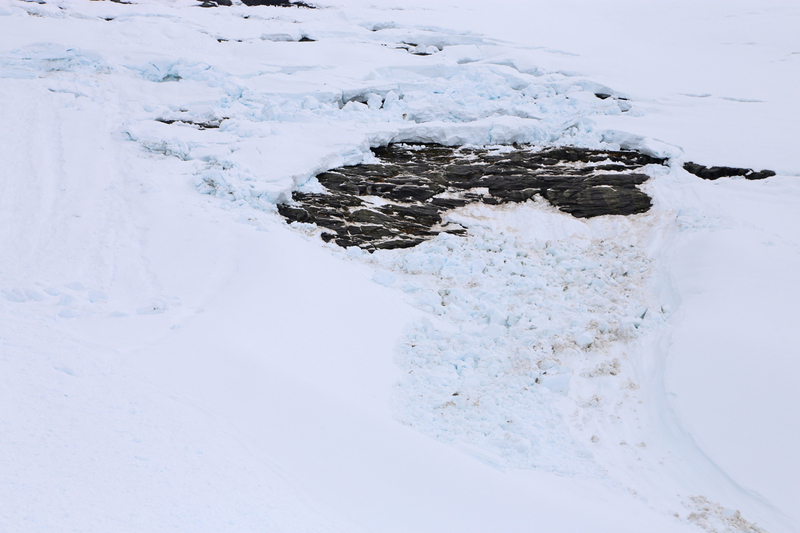 The crust broke and we generally stepped 30-50 cm into the snow. We stayed right at the crest of the ridge all the way up to the first summit. Slightly worried about not having any views, since the summit was in a cloud and visibility was poor. Fortunately, this did not last long. The cloud cleared and we had good views and nice sunshine for the rest of the climb. 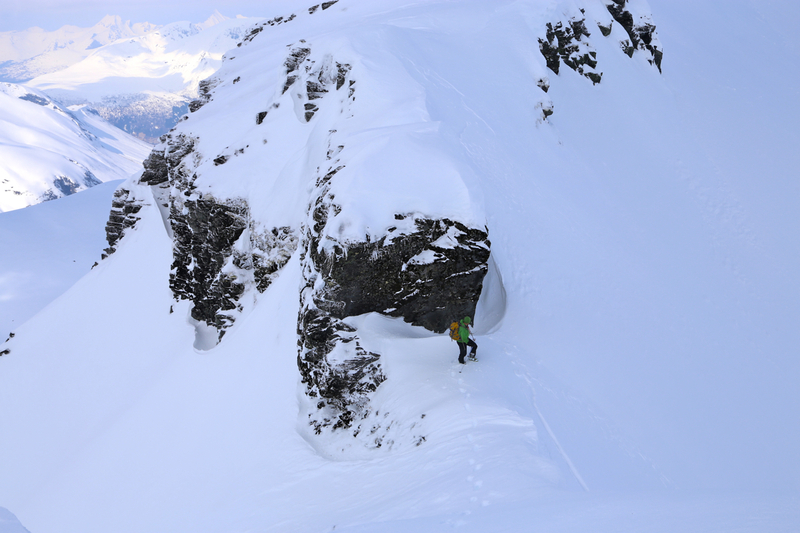 We descended to the crux area of the route, a big rock face blocking smooth access along the top ridge. However, the winter bypass on the right hand side turned out to be quite straightforward. The rest of the climb was pretty straightforward. We were at the summit by 1035, about 4 hours from the start. The views were nice all around. 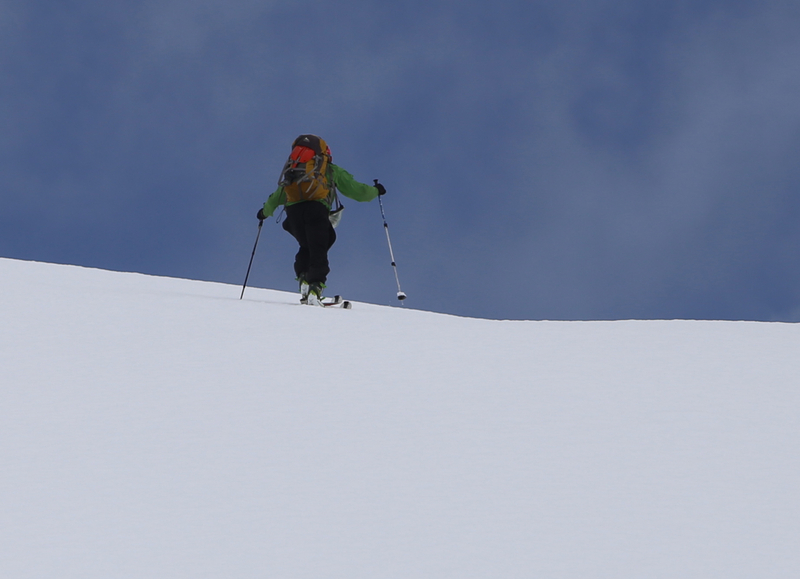 We left at 1355, descended back down to the skis, then skied down the same line as we had ascended. We were back at the car around 1615, so about 2:20 for the return trip. 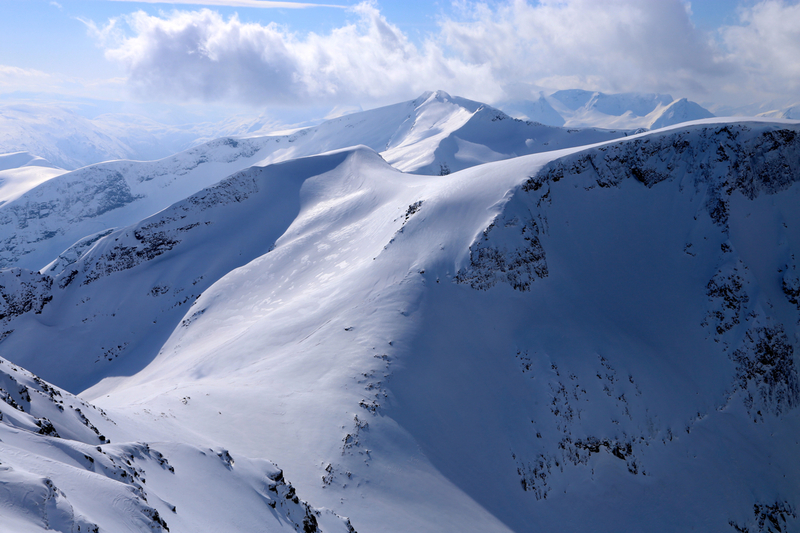 Kvasshornet, the summit is left, the Jolhornet summit is right. 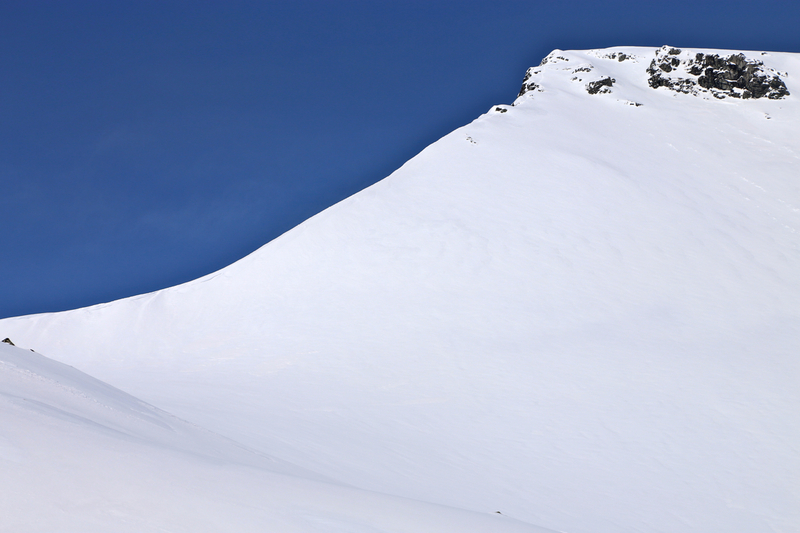 The ridge from Kvasshornet to Jolhornet. 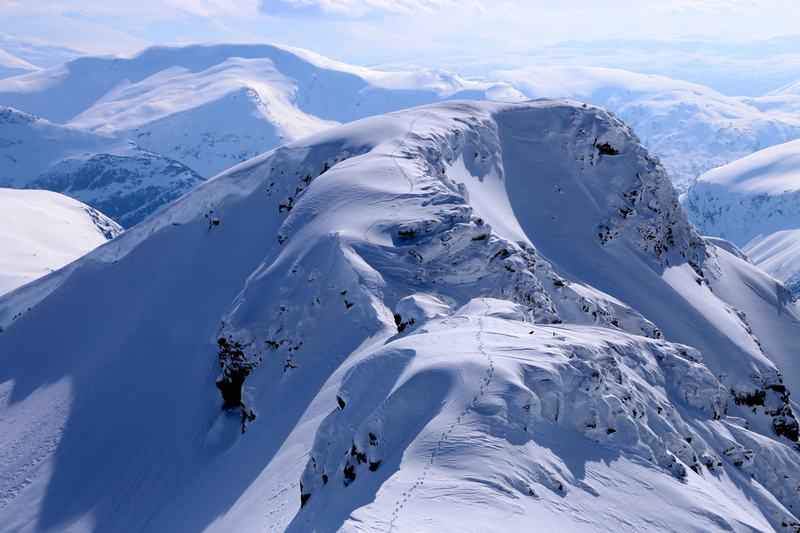 Bakkedalen, as seen from the top ridge. 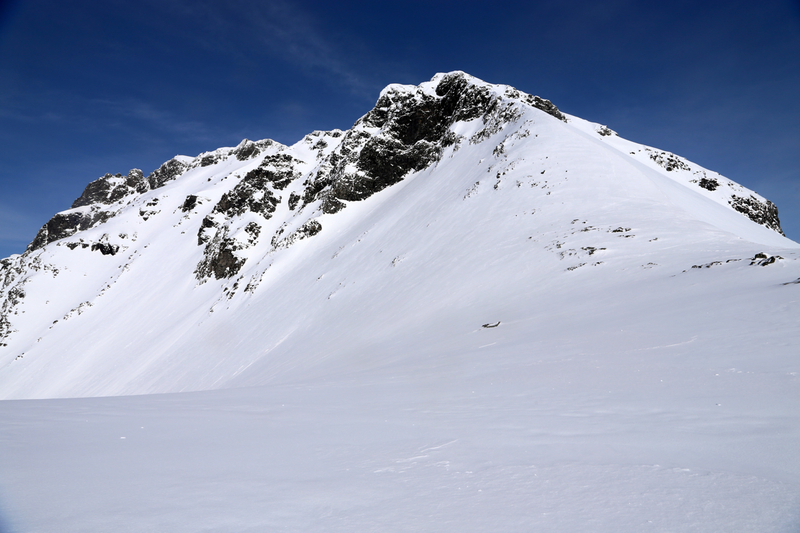 The col, as seen from the top ridge. Stig Anton, returning along the top ridge.